Plex is a media server application which imports video and audio content from pc, as well as network, and streams them to smart TVs, streaming boxes and mobile devices including Amazon Fire TV, Chromecast, Ouya, Roku, Xbox 360, Xbox One, Playstation 3 and Playstation 4. Have you ever downloaded some TV shows from TiVo and want to stream them via Plex for playback? Looking for a software program that will convert TiVo shows to Plex Media Server compatible file type? Read this article and help you stream TiVo files via Plex Media Server without problems. It is quite hard to upload TiVo videos to Plex Media Sever for streaming to Roku, Xbox 360, PS3, Android/iOS devices? As a matter of fact, all these issues are caused by the file format compatibility. As far as I know, Plex can’t handle TiVo format. TiVo is an encrypted video format, that’s why few media players can play it well and some freeware can’t handle it. 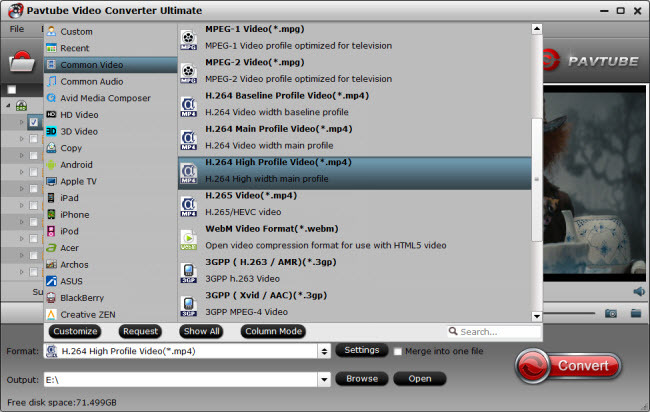 To get the work done, I found more than one people recommend Pavtube Video Converter Ultimate to encode TiVo to Plex. Here is review. Overall, this video app is professional on fast transcoding TiVo to Plex Media Server with MP4 format without quality loss. In addition, it not only supports TiVo videos, but also handles various common video formats, like MKV, MXF, MTS, MOV, MP4, AVI, WMV .etc. Plus, with the built-in video editor, you can also choose to trim, crop, add watermark to your original videos. 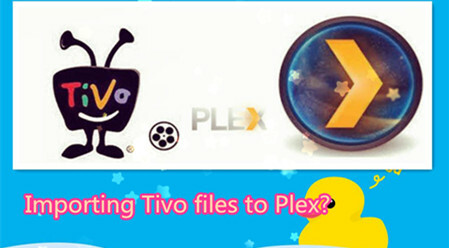 Here our task is to encode TiVo to MP4 for Plex Media Server. The process is much simple. For Mac users, iMedia Converter for Mac is also a helpful app to encode TiVo to Plex on Mac OS X(Yosemite, Mavericks included) for further usage. Follow below guide to start TiVo movie to Plex conversion on Windows 10. After the successful installation, click “Load file(s)” or “Add video”to load TiVo video into the program. Tip: When first loading, Pavtube TiVo Converter will ask you to input your Media Access Key. 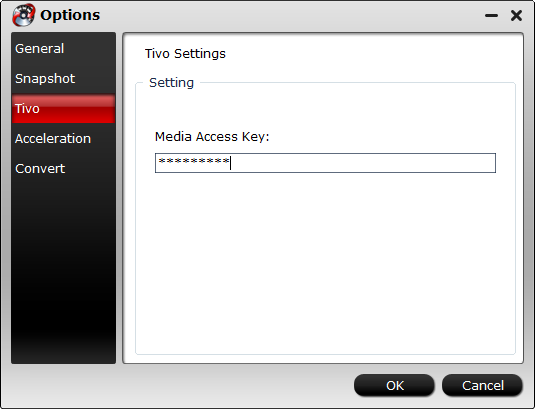 Simply press “Option” button and switch to “TiVo” tab to enter your Media Access Key, and click “OK” to confirm. Simply click Settings bar and you can tweak the settings to your satisfaction. With the right settings you can retain the quality of the original videos while also saving space. This is particularly helpful when streaming over your network, depending on your network quality. Tap the Conversion button on the main interface to start transcoding TiVo to Plex Media Server. The process will be finished soon. After the conversion, you can easily find the encoded TiVo video clips in the destination folder by clicking “Open” button for playing and sharing to your other devices via Plex Media Server. Then follow here to add movies to Plex to make your media experience easy and enjoyable. Enjoy Plex! Now, Plex Media Server will recognize, play and stream these TiVo recordings beautifully.